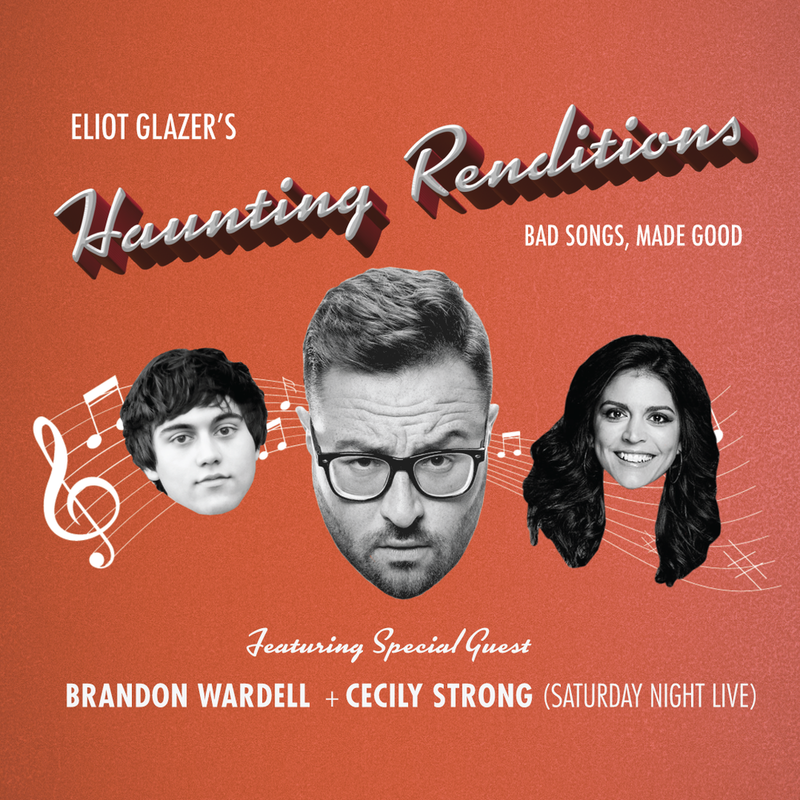 Eliot Glazer's HAUNTING RENDITIONS with special guest Saturday Night Live’s CECILY STRONG + Brandon Wardell. Based on his web series of the same name, HAUNTING RENDITIONS is what happens when Eliot Glazer, a classically trained vocalist-turned-comedian, takes some of pop music's most infamous songs and turns them into highbrow, sweeping ballads. Like a twisted version of MTV Unplugged, Austin City Limits, or VH1 Storytellers, ELIOT GLAZER’S HAUNTING RENDITIONS is an intimate night of bad music made good. ELIOT serves as a supervising producer on the TV Land series, TEACHERS, is the showrunner of the MTV pilot, GAY CODE and is in development at Comedy Central on the original, half-hour PLATINUM STATUS with executive producers Will Arnett and Ilana Glazer. He also writes for Comedy Central's BROAD CITY, where he can often be seen appearing as 'Eliot.’ Other writing credits include; Darren Star's TV Land series, YOUNGER, Fox's THE NEW GIRL starring Zooey Deschanel, VH-1's BEST WEEK EVER and Comedy Central's TIME TRAVELING BONG. Eliot has contributed to Funny or Die's BILLY ON THE STREET, Hulu's DIFFICULT PEOPLE and Bravo's ODD MOM OUT. He can be seen on the Nat Geo series DUCK QUACKS DON'T ECHO, the Hulu series DEADBEAT and on Comedy Central's @MIDNIGHT. Eliot also writes, produces and stars in the Above Average sketch web series, ELIOT'S SKETCH PAD and can be seen performing live at HAUNTING RENDITIONS, his bi-coastal, monthly night of musical comedy.